O. Leslie Stone comes by his penchant for hard work naturally. His parents, Frank J. and Mabel Crandall Stone, were strong and industrious homesteaders who were farming a tract of land near Chapin, Idaho, when their son Leslie was born May 28, 1903. Before the youth had started school, his parents decided on a plan that they hoped would lead them away from their crowded two-room log cabin and the back-breaking “sod busting.” They determined that if Sister Stone and the children could operate the farm, Brother Stone could go back to school, hopefully to become a businessman. And it wasn’t long until the family’s diligence was rewarded. Frank Stone started a mercantile business in Driggs, Idaho, in 1909, and when Leslie was eight, he was sweeping floors and running errands in his father’s store, beginning a career in marketing and merchandising that was to span fifty-two years. He completed one year of high school in Driggs and then went to Brigham Young High School in Provo, Utah, where he graduated in 1920. Schooled well by his parents in the gospel of work, he obtained a job with a bank in Price, Utah, soon after graduation. Before the year was over he moved back to Idaho, where his father’s business had expanded to include the Blackfoot City Bank. The next four years set the course for Elder Stone’s later successes in business. He was hired as the bookkeeper in his father’s bank, and outside of banking hours, he did the bookkeeping for several other businesses, sold Model-T Fords, and managed two dance halls. Elder and Sister Stone were married in the Salt Lake Temple April 23, 1924. Following their marriage, they joined Elder Stone’s brother as partners in a store in Susanville, California. Later they started a second store in Klamath Falls, Oregon. During the next five years the business expanded rapidly to include thirty-two stores throughout Oregon and Washington. In 1929 they merged with another company and Elder Stone became a division manager of seventy-five stores with headquarters in Portland. In 1931 Elder Stone began another career, this time with Safeway Stores, Inc., in Portland, where in time he advanced to the position of vice-president with residence in Oakland, California. In 1946 merchandising tycoon M. B. Skaggs asked the president of Safeway if he would let Leslie Stone come to work with him to start a new company. “I’m asking you first,” Skaggs said, “because I know how much you value him in your organization.” The invitation was then made to Elder Stone, who sensed a new opportunity and challenge. The new company was organized with O. Leslie Stone as president and co-founder of Skaggs-Stone Wholesale Company, serving stores throughout the western United States. In 1963 Elder Stone resigned to devote himself to family investments and Church responsibilities. Throughout the years Elder Stone served in a number of positions in the Church, including bishop of the Oakland Fifth Ward and president of the Oakland-Berkeley Stake. He was also chairman of the Oakland region of the Church welfare program and chairman of the Oakland Temple district, prior to and during the construction of the Oakland Temple. 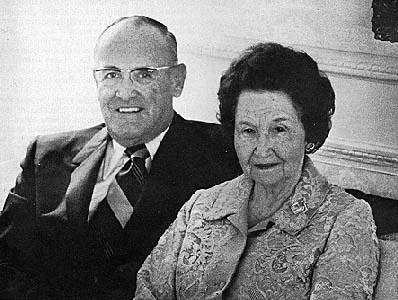 Elder Stone was called to be a Regional Representative in 1967 and served in that position until 1968, when he was named president of the Salt Lake Temple, with Sister Stone serving as temple matron. When they were released from their temple assignment in August 1972, Elder Stone was reassigned as a Regional Representative. Elder and Sister Stone are the parents of four sons, two of whom﻿—James Reed and Douglas Stone﻿—are deceased. Their two living sons, Ronald V. and Thomas R., presided over the Argentina North and French Polynesia missions, respectively. The Stones also have fourteen grandchildren. That attitude, coupled with his simple and sincere pledge delivered in general conference in October﻿—“I love the Lord, and I want to serve him”﻿—mark Elder Stone as one of God’s choice and valiant servants.